Some children are drawn to a good book. Other children fight to find a story or character that engages their imagination. Kohl's Cares brings the gift of reading to all families at an affordable price. 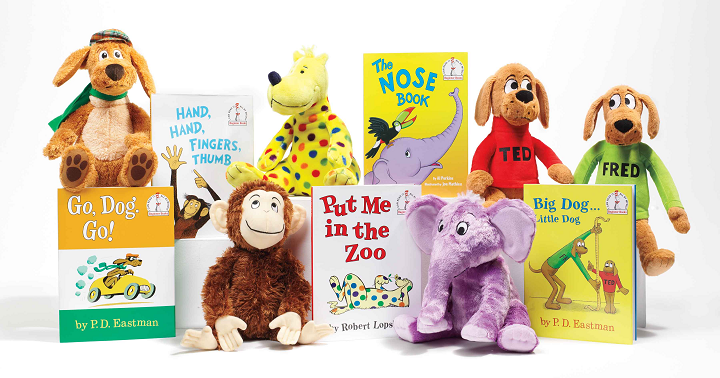 Now through April 5, Kohl’s Department Stores is offering exclusive hardcover Beginner Books and coordinating plush toys for just $5 each. Kids will delight as they begin their journey into independent reading with the exclusive editions of Put Me in the Zoo, Go. Dog, Go!, The Nose Book and Hand, Hand, Fingers, Thumb and the adorable coordinating plush toys. Parents will not only be proud of their little one’s effort but to support the Kohl’s Cares merchandise program knowing Kohl’s donates 100 percent of the net profit to children’s health and education initiatives nationwide. The idea of pairing classic books with their stuffed animal counterparts is perfect for encouraging reading. Studies show that kids who struggle with reading to an adult diminish their fears when reading to a stuffed animal. Children feel less pressure to read every word or pronounce every sound correctly. Overall they are encouraged to continue their practice and the experience becomes fun. Plus, kids love having a furry friend jump out of the pages of the book and into their lap. After reading time is over, the kids can go on new adventures with their new friends. From new car rides with Dog to a trip to the local zoo, your kids can create memories beyond the pages of the books. The older readers aren't left out either. Kohl’s is offering fabulous cookbooks for adults. Books include, Cook This, Not That – encouraging healthy options while creating delicious meals; and Delish – Just Four Ingredient Fast – helping you take the hassle out of meal planning. Next time you are shopping for a new Spring outfit, make sure that you grab a few items off the Kohl's Cares shelf. A little purchase goes a long way. Disclosure: I received items to review. All opinions are my own.